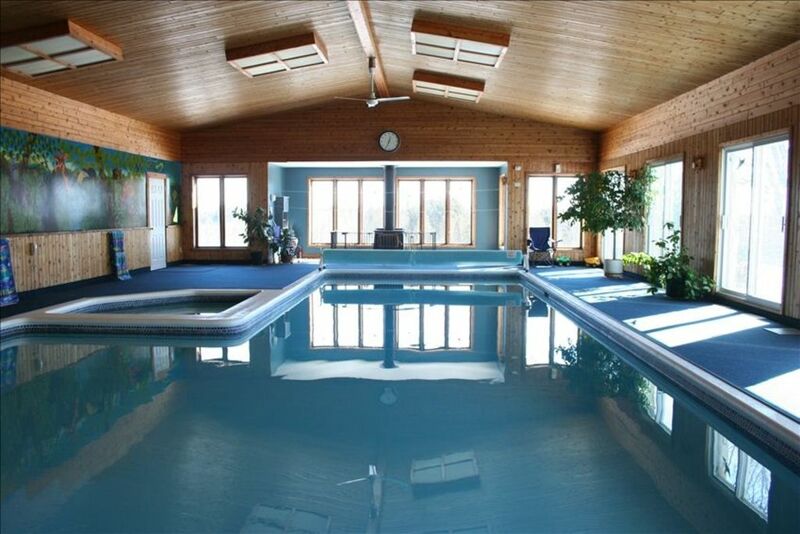 This Cottage has the largest private indoor pool for rent in Canada.Activities Activities Activities!!! There is so much to do for all ages at this cottage. It's like your own private resort... Fantastic no matter what mother nature throws your way. It's the perfect cottage to ensure the weather is not an issue. Enjoyment,relaxation and entertainment for all ages.. Parents will never hear there kids say they are bored.The kids have so much to do that the adults can relax and have a holiday without constantly trying to keep everyone entertained. The main feature of this cottage is the 2000 sq ft attached pool building with a 40 ft Indoor pool and a 10 person hot tub.The warmth (30 C water temp)of this year round facility will keep you bug free in the warmer months and leave you forgetting about the Caribbean in the colder months.Go jogging indoors as 25 laps of the pool is one kilometer.There are three acres of landscaped grounds with two Weber BBQ s(one with rotisserie),full size sand filled regulation beach volleyball court,fire pit,children's play structure,sandbox, tennis and basketball court on the 5000sq ft asphalt sealed driveway and a toboggan hill (toboggans supplied). Seasonal vegetable are available in large organic garden. Inside there is WiFi access for your laptops and devices,8 x 4 pool table,darts,board games, satellite TV(2 x 60',1 x 51', 1 x 42' and a selection of movies) plus three XBox's(1 kinect 6 controllers and a selection of games). This is an ideal vacation for large family gatherings, groups,several families or as a corporate retreat. Private Retreat within easy commute of Ottawa and Montreal and a great base to explore Eastern Ontario, Western Quebec and Upstate New York. Lake Placid in the middle of the Adirondack Mountains is within two hours as is Mont Tremblant in Quebec. The St Lawrence river is 10 minutes away with all its water related recreational activities and there is a free area to launch your boat in Cornwall which is 12 minutes away. There is a nice sheltered beach 15 minutes away on the St Lawrence where you can enjoy water related recreational activities.Free boat ramp in Cornwall 12 minutes away to launch your water related recreational toys. I am a New Zealander who has lived in Canada since 1997. Lucky to have travelled to over 125 countries so ask me and maybe I have been to your country and home town. It is a nice rural area with all the advantages of two of the larger cities in Canada. Ottawa, Canadas Capital and Montreal with its French influence. New York State in the USA is only 15 minutes away and is the gateway to the Adirondack Mountains(Americas Largest National Park)with Lake Placid a beautiful two hour drive from the cottage..The area is in the centre of a lot of Canadian culture and the St Lawrence River with all its water related activities is 10 minutes. away. One of the best features of this cottage is the space indoors. Never have the weather spoil your holiday again. Each season has its charm from swimming without the bugs to floating in the pool while a winter storm rages outside. Go jogging indoors as 25 laps around the pool is 1 kilometer and you won't slip as the whole area is covered with an all weather carpet. This cottage has the warmth of summer every day of the year. Outside on the properties grounds there are seasonal year round activities from table tennis,tobogganing to beach volleyball.A unique place to relax and be entertained. toilet, shower, Located in pool building with full laundry facilities. Propane 50000 Btu free standing with open flame (look of woodburner) in basement. 5000 sq ft sealed driveway (28' wide x 200' long). 2 x 18 cu ft all fridges that can convert to all freezer + 1 x18 cu ft fridge with bottom freezer. 1 x 18 cu ft fridge/top freezer in garage. Two self clean ovens. Ceramic stovetops on ovens have 4 elements ( 2 expanding ) and a warmer element. Two 4 slice bagel toasters. Tea, coffee, hot chocolate, sugar ,salt, pepper, selection of herbs and spices,flour and yeast for breadmaker and a selection of condiments in the fridge(take some leave some policy with guests). Aluminium Dining table accommodates 26 guest + dining table seats 8 guests + 3 x 6ft folding tables seat 18 guests.Dining for over 50 guests in same room.High chairs(2) + 1 booster seat. (4) 2 x 60',1 x 51', 1 x 42'. Bluetooth speaker in pool area. Bring your own music. Variety of board games,cards and XBox games. 2 huge boxes of toys. Large selection of Blurays/DVDs for all ages. Variety of games for XBox. 3 acres of private landscaped grounds featuring apple trees,organic vegetable garden,toboggan hill,full size beach volley ball court,Table tennis. Rental places 15 minutes away on St Lawrence River. Xcountry ski trails and snow shoe trails in back forest. Local municipality rents all equipment. Portable tennis net for use on huge sealed driveway.Raquets and balls supplied. Summerheights Golf Links 10 minutes away. Heritage Golf club and Cornwall Golf and Country Club both 15 minutes away.Several other courses within 30 to 45 minutes. Stone pathway for wheelchair access to code (1 inch height increase for every foot of travel). This gives access to the main floor with a small ramp to the pool area. No wheelchair access to basement. 40 ft long L shaped. 3ft to 8ft deep and kept at 30 degree Celsius all year round. No air blowers just straight hot tub. The facilities and on site activities are unmatched by any other cottage in Canada.It's more like your own private resort.Largest private indoor pool of any private rental cottage in Canada.10 person hot tub,Beach volleyball,jog indoors,tennis,basketball,pool table,darts,foosball etc etc. So much to do for all ages. Large fire pit with wood supplied. Every other year, we do a Christmas trip with our children and grandchildren. Including our elderly Mom and 2 nannies for the little ones, we arrived with 26 of us. What a great place!! The pool, of course, was a massive hit with everyone (and the hot tub, too). Kids slid down the hill behind the house, as well. Indoor entertainment was amazing and all of the beds were comfortable...seriously, all of them! Typically, with this many sleeping spaces, you are going to find that someone did not sleep comfortably but that was not the case. Dishes, towels and any other needs (paper towels, bathroom tissue etc) were in abundance. We were thrilled and are hoping we may make it work in another two years. Thanks Frank, for you care and Happy New Year! We stayed for two nights for a weekend long bachelor party. The place was very clean and comfortably slept 21 full grown guys. The property is huge, and when the weather didn't cooperate it didn't matter because the house itself is so big, and of course the pool. The big screen tv in the pool room helped as well. Frank was a great host and would always respond within the hour to any question we had in the run up to the visit. The house had everything we need, towels for everyone, bedding dishes glasses, and three, maybe four, very large refrigerators. Two BBQ's and 2 ovens which were all put to very good use. Everyone was very impressed and I think a lot will be looking for a reason to book the house in the future. Also the beer store is only a 12 -15 minute drive away for when you run out of beer. We had a family get together in Aug and booked this cottage for 3 nights. It is about 5 hours drive from Toronto (Much closer to Ottawa and Montreal - within 2 hours drive from both locations) but I must say that it was worth driving all the way for. It is located very close to Hwy 401 but far enough to make it feel like a cottage in a very quiet neighborhood. It has large and well-taken care off, front and backyard in addition to a long driveway (enough to park 10 cars). It has a great beach volleyball area (didn't end up using it) plus a play area for younger kids (they loved the model ship in the play area). The cottage is designed to accommodate 20 -30 people with enough space to have all sit at the dinner table and enjoy a family meal. Rooms are very clean and there is more than enough storage and fridge space (3 fridges), icemaker, coffee maker etc. In terms of entertainment, this cottage came with few 50 inch plus TV's and game consoles etc. plus a pool table, tennis table and a lot of toys for kids to keep them entertained. I can safely say that this is the best-kept and managed cottage we have rented in the last 5-7 years. Frank (owner) is a super nice guy and very responsive. He visited every day to check the pool water to make sure it was safe for us to swim. When I initially saw the listing, I was a little scared to make the reservation as it looked like too good to be true but we are glad that we went ahead. One of the best family gathering we had in the last few years and the reason is the way this cottage kept us all together at one place rather than different groups running in different directions to keep them entertained. The only negative comment which I got from few in the group was that there are more than enough bunk beds to accommodate all but few more rooms will be a nice addition to this wonderful cottage. We absolutely loved our weekend at Frank's cottage. There was over 40 of us and we had more than enough space. Huge kitchen table was amazing for feeding all the kids at once and ample fridge space for everyone's food and drinks. Pool, hot tub and volleyball court provided hours of entertainment for the kids and adults. Bunks are very sturdy and all have nice mattresses so they are comfortable for adults too. We had a wonderful time and would definitely go back! Frank was an excellent host, greeting us when we arrived and showing us how everything worked and coming back subsequent days to make sure pool was nice and clean. Another great stay at this fantastic place! We visited with adults and 13 kids and it couldn't have been better. The new bunk beds downstairs are great the kids loved them. Pool was fantastic as always and house clean as can be. Thanks again Frank! Awesome place to get away with family and friends! Many activities on site, lots of sleeping space! Awesome place! You said that this place is unique in Canada. We certainly believe it as nowhere else would have been suitable for our Mom’s surprise retirement party. Thanks for giving us a place to celebrate this special moment in our Mom’s life. Hopefully we will come up with another excuse soon to head out to "Murphy’s Retreat”. Au Revoir! From Jen and Laurie and almost 35 other party guests. P.S A special thanks for your efforts in making the place “special mobility needs friendly”. Our grandparents couldn’t have been with us otherwise. Extra activities on property include :-Full size sand filled beach volleyball court.35' x 60' ice rink. X Box Kinect(games provided),Tennis + Basketball(All raquets and balls provided) on 5000 sq ft sealed driveway,Darts,Foosball,Toboggan Hill(toboggans provided),plasma cars and trikes,board games,sand box and a large selection of childrens toys. *Rates include applicable taxes. *A $2000 deposit is required to secure the booking. * There is also a $1000 refundable security deposit. *There is also a $250 departure cleaning fee. Rates for 1 to 24 guests.Extra fee for 24+ guests.PLEASE NOTE: CHECK IN ON FRIDAY OR SUNDAY ONLY FOR FULL WEEK BOOKINGS. * 3 night minimum for public holidays.